Where Magic and Science collide. Where Aliens and Fae and Humans coexist and battle. 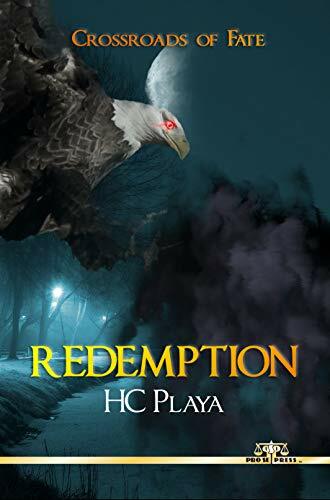 A world like no other thrives, dies, and battles on in the third book in HC Playa’s CROSSROADS OF FATE series-REDEMPTION from Pro Se Productions. A single instinctive act and Mh’airi’s world changes forever. The last of the Dédanaan, she protects humans from the monsters they didn’t know existed. She keeps to the shadows, knowing she can never really be a part of the human world. Now she has saved Finn, a Fae prince. Has she spared a monster or saved a man? Judgement must wait, for when Finn returns them to their proper place in time they find war raging between humanity and the monsters Mh’airi has spent her life fighting. On all sides humanity faces threats. No longer safely hidden in the shadows, Mh’airi finds herself in the center of Fae court intrigue. Her loyalties are tested as the Tuatha De’ Danann and the not-so-dead Dédanaan take sides along old battle lines placing Earth and humanity in the crossfire. Mh’airi must choose her path, for herself, and for the sake of Earth. REDEMPTION by HC Playa. From Pro Se Productions. Featuring a stunning cover by Antonino Lo Iacono and print formatting and logo design by Lo Iacono and Marzia Marina, CROSSROADS OF FATE: REDEMPTION is available in print at Amazon and on Pro Se’s own store at www.prose-press.com/store for $14.99. The third book in Playa’s fascinating science fiction/fantasy hybrid series is also available as an eBook formatted by Antonino Lo Iacono and Marzia Marina for the Kindle for only $2.99. The book is also available to Kindle Unlimited members for free. The first book, DAUGHTER OF DESTINY and the second volume, BETRAYALS, in the CROSSROADS OF FATE series are also available on Amazon in digital and print formats. For more information on this title, interviews with the author, or digital copies for review, contact Kristi Morgan, Pro Se’s Director of Corporate Operations, at directorofcorporateoperations@prose-press.com. A NEW PULP LEGEND’S EARLIEST ADVENTURE NOW ON AUDIO! DERRICK FERGUSON’S ‘YOUNG DILLON IN THE HALLS OF SHAMBALLAH’ DEBUTS!